Today was a nice day, the weather was nice, not too hot and not too cold, and I learnt many new things. The reason why we come to train in Japan is to better our knowledge about proper movements and today was full of insights at all levels. I spoke with two Swedish friends, Petter Swedin who is living and studying in Sapporo (Hokkaido) and his friend Erick who is studying electricity engineering here in Japan, and they explained the reasons why the Japanese have had some issues with their power grid after the tsunami. When in the 19th century electricity was first introduced to Japan it was through the Europeans. The Europeans are using a 220v/50 herz technology. When the Tokyo power grid has been rebuilt after the war by the Americans, they used a 110v/60 herz technology. So until this day Japan has been using two different power grids that are not easily compatible together. After the Tsunami transferring power from one part of Japan to another proved to be difficult and with so many electricity production unit down it took them some time to be able to supply electricity to the whole country. This is a lesson from History. Petter and Erick please feel free to add your comments if you need to add or precise anything. I found it really interesting and my guess that in a near future when the Japanese will have recovered from this major disaster, they will find ways to unify their power grids so that it never happens again. Our actions are dictated by our evolution and past actions create the conditions of the present, and of our future survival. This is a true budô lesson. Playing with the Japanese sounds, denki (電気), “electricity” can also be written as denki (伝記 ), “life story” but could also be denki (伝気), “transmission of energy” or tenki (天気), “energy of heaven” (weather). Therefore through the story of our training life we evolve from electrical power into the transmission of the energy of heaven. In other words we grow from chi no sekai (地 の世界), in the material world, to the ten no sekai (天の世界) in the spiritual world, through the connection of the jin no sekai (神 の世界) in the divine world! The link between heaven, earth and man is the step stone of the bujinkan tenchijin and forgetting it can prove to be painful and a big mistake. During our fist class of the day with Noguchi sensei we covered a big part of the jin ryaku no maki from the tenchijin. We studied many things but this class was for me like a real sanshin. First and in relation with what I just wrote, I finally understood gokuraku otoshi (極楽落し, falling from heaven). In this particular technique, the movement is applied onto the arm (ten) and finished by sliding uke’s leg to make him fall to the ground with jigoku otoshi. Actually you trap the jin by playing the ten (arm) and the chi (leg). That was an eye opener for me. I have been training bujinkan for over 27 years and I trained this technique many times but only now I became aware of its signification. As Hatsumi sensei wrote in “Unarmed fighting techniques of the samurai” on the introduction of the first level of the Gyokko ryû: “it is important to know the meaning of the names of the techniques”. My second discovery was something Noguchi said during another technique. He said: “here you can do three things: oshi, otoshi, nage”. We are all aware of the differences between otoshi (落す otosu to make someone swoon) and nage ( 投げる nageru) but it was the first time I heard of oshi (押す osu to push). As this is often the case with what we learn here in Japan, it sounds so logical that “pushing” uke could be part of the technique that you always feel stupid not to have known about it in the first place. And again, this is why you have to come and train in Japan with Sôke and the shihan because each class will bring new insights on what you are supposed to know. The last part of my sanshin for today happened when doing yume makura (夢枕) and for the first time in my many years of training I understood the difference between yume makura and te makura (even though I thought I knew it). Makura is the modern Japanese name for pillow (also to lead in), but as it is often the case with the evolution of languages the original meaning meant “support” so the “hand pillow” used to be a “supporting hand” pushing up onto the elbow joint. In yume (dream) makura, you are now supporting your dreams like the buddha lying down onto the ground and supporting his head. In fact the whole secret is to use yori modoshi (寄り, to give up, and 戻し, returning or giving back) to transform the seoi nage into a te makura to bring uke down to the ground. The body action looks like a “8” loop moving forward with the seoi nage, pushing uke backwards in the direction of his tension, extending his arm and going down with him to the ground. The idea is to push/pull uke and togo up/down to bring him with you to the ground. 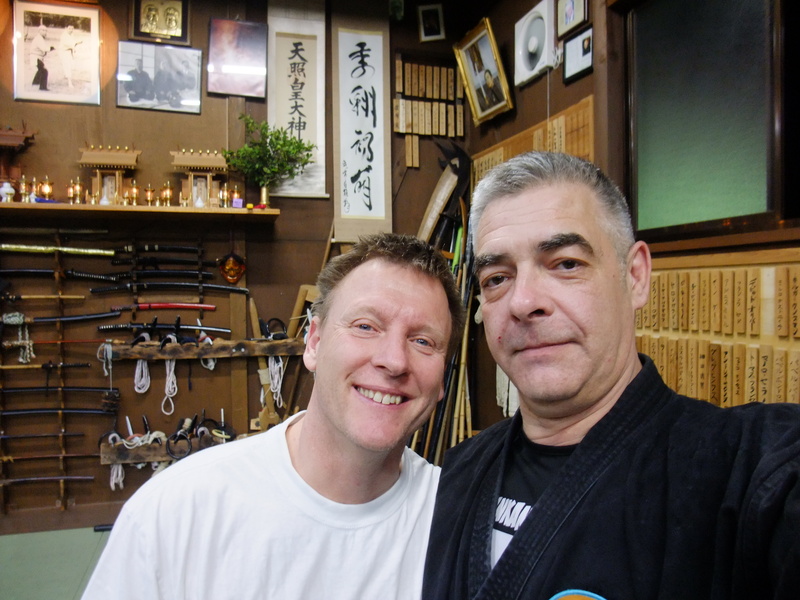 Noguchi sensei was brilliant as usual and I learned many details that will improve my whole taijutsu. Unfortunately, the class ended well before we covered the whole jin ryaku no maki. But those being in Atago next Friday afternoon will have the chance to study the remaining movements with Noguchi sensei. The class with Sôke was also an eye opener (physically and mentally). Many students were there and many newcomers too. My friend Gillian freshly arriving from Australia was there too and I am always happy to see her. Whenever she is in Europe to visit her relatives, she hops by to my dôjô in Paris and train with us, and it is always a pleasure. Thomas Franzen from Sweden was asked to demonstrate a few techniques in his dynamic and efficient taijutsu and Sôke used them as a start for his painful techniques. He insisted again on the permanent use of the fingers to inflict pain on uke’s fingers or his face and that it was in the theme of this year. At one point he showed how to use the fingers on the face and how to inflict excruciating pain on a few kyûsho at hiryuran and jinchû at the same time. My partner for the class asked sensei to demonstrate the technique to him and he came back bleeding I am sure he will remember it for sure. The best way to learn is to ask Sôke to do it on you then pain becomes your teacher. Speaking of pain, Nakadai sensei, Shiraishi sensei and Yabunaka sensei were used many times and you could “hear” the pain. I now know that not only gaijin can scream, pain is universal! He also said something about kyûsho (急所) that Steve did a nice job translating sôke’s words for the whole but here he had a hard time getting it. Steve even said to his partner: “sensei knows I cannot translate that, so I guess this is part of my training”. The idea was that you don’t go for the kyûsho straight but only for the area around it, uke’s reactions will create the conditions of pain. Sensei often teaches at multiple levels and getting you off balance by forcing you to do things you are unable to do is part of his way of teaching. Another thing that sensei said during the class is that you can outmaneuver your opponent by making him think that you do not know what you are doing. If uke thinks that you are a bad fighter, he will get a false sense of superiority speed up his downfall. After all deception is ninjutsu and inyo is everywhere! Sensei was in a very good state of mind and we also did many sannin dori techniques, he said that movements do not need to look good, on the contrary and that sannin dori is the best way to develop actual fighting skills. And that you cannot find that kind of training in gendai budô, only in bujinkan. After a very short break (there was no calligraphy session) sensei asked me to demonstrate a technique. It was some kind of tenchi inyo movement with seoi nage/harai goshi type of throw at the end. Sensei asked to demonstrate it a few times slower and slower and we played with this until the end of the class. Sensei added many painful finger grabs and multiple soft hits to disorient uke. When you receive multiple speedy slaps on the face and the body, your brain becomes unable to deal with all these information. There is no real pain only a flow of little pains as if you were fighting a bee hive or a poisonous jellyfish. We also did some daisho sabaki movements with nearly each technique, learning how to use our sword or uke’s sword still in the belt and crushing uke’s fingers at the same time. Sensei said that this was real fighting skills and that it was quite far from the modern ways of sword fighting taught in the “traditional schools” in Japan. Finally we ended with a simple mutô dori technique where you go forward on the jodan kiri. Moving forward he said is the best way to avoid the cut as uke will avoid you. In real fight you create opportunities by not playing the game according to uke’s perceptions. If you try to dodge the cut you get cut but if you walk calmly towards uke then you can control his space and get a hold on his forward hand (and crush his fingers on the tsuka). A nice class full of pain and discoveries. 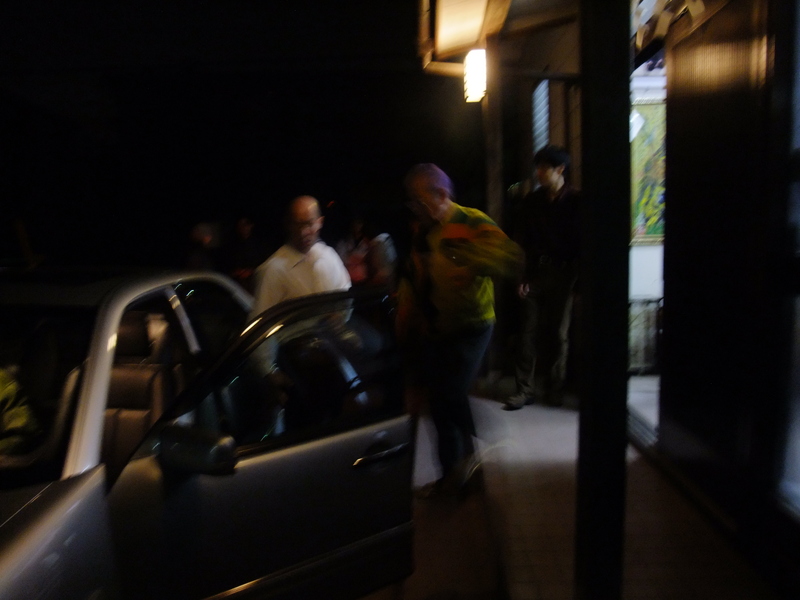 The sakki test session was strange as none of the four applicants could get it. They had only one chance. After the last one failed sensei decided to stop the sakki test, they will all have two more chances on Sunday. This was also a lesson as Sensei could feel that the conditions were not good last night so he adapted to the flow and canceled the second chance. The “givers” and the “takers” are not to be criticized, the moment was not correct and Sensei took the right decision. Knowing when it is time and when it is not time to do something is also part of our training. Ninjutsu is about awareness and developing the ability to seize a situation should be an important part of our training. 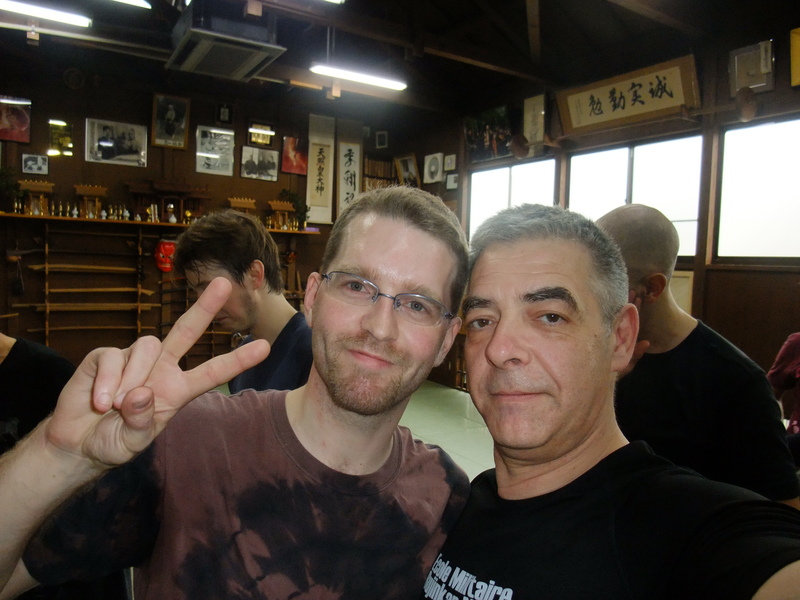 At the beginning of the class, Anthony Netztler from New Zealand received the gold medal of the Bujinkan for his long training and achievement. We had a nice talk in the train going back to Kashiwa. 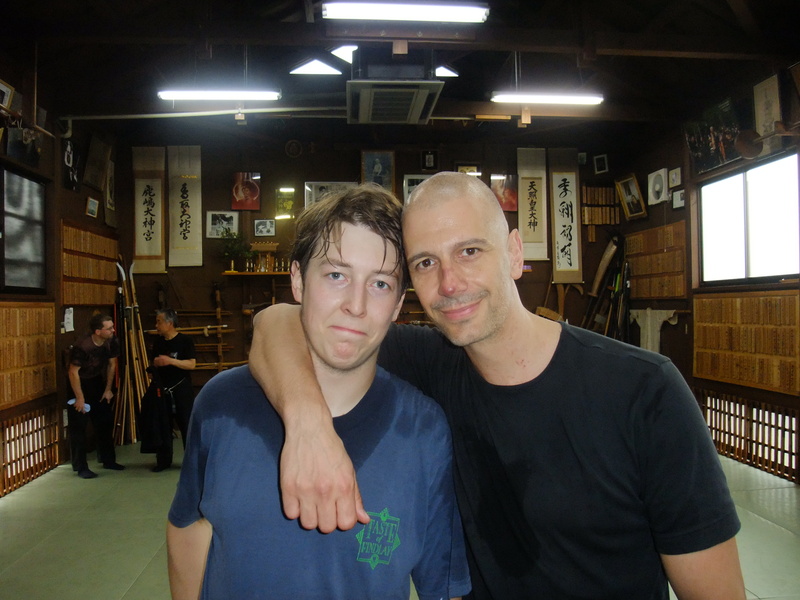 Anthony has been living many years here in Japan and is one of the pillars of the bujinkan and he deserved this reward. In the past Sensei would give the gold medal mainly to the visitors and not to the residents I guess this is why Anthony didn’t get it a long time ago. Thank you Anthony for your presence. 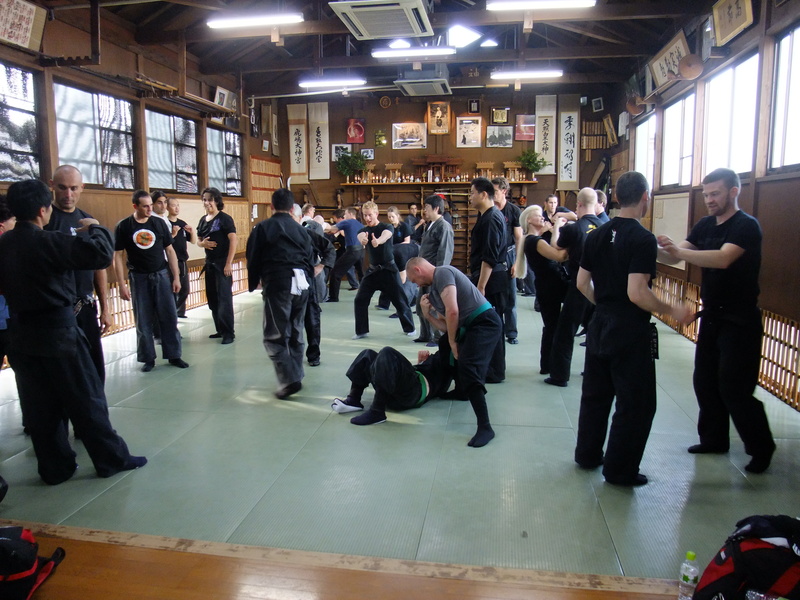 While writing this article I met a Japanese woman Kazue san who spoke very good English and whose kids are training bujinkan with Duncan Stewart. We had a very nice discussion about Japan, the tsunami, Fukushima and the way things are understood from the other end of the world. 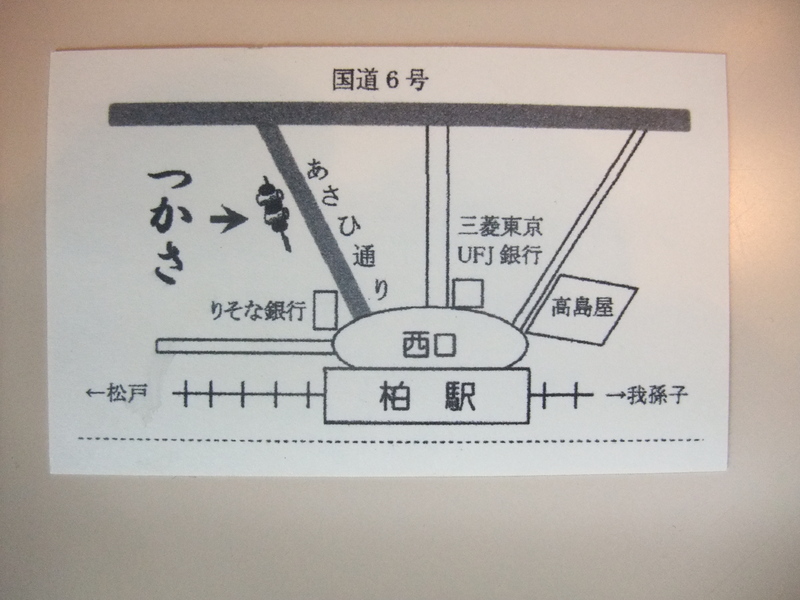 Her father has a yakitori restaurant called tsukasa (つかさ) in the same street as the Kashiwa Plaza Annex Hotel with a “ninja menu” in English (see map). I invite you all to eat there during your next stay in Kashiwa. (modified end – a few hours later) After this post was sent, I got two messages from Duncan and Kazue san telling me that I got it wrong. 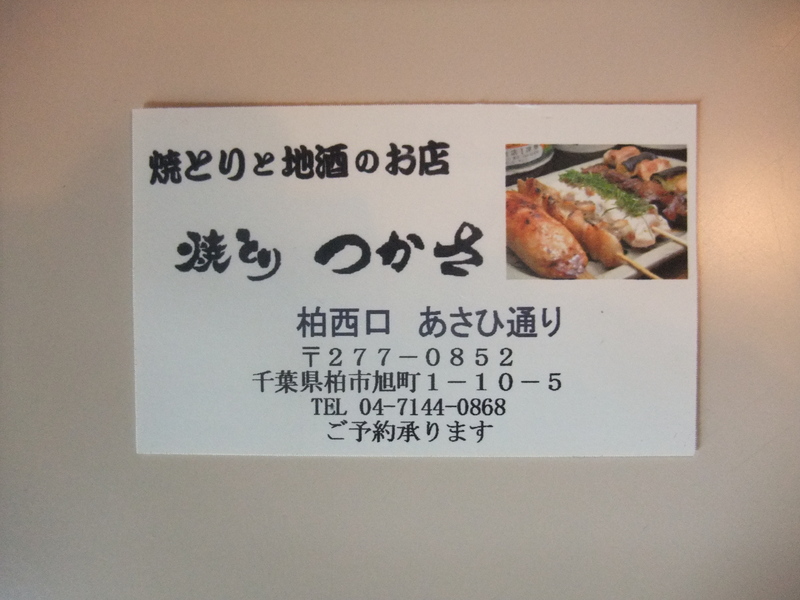 Thank you very much for posting our Yakitori TSUKASA restaurant. If I am not at restaurant when guests from Bujikan came in. Please tell to my parents, you are from Bujikan. Then they can show you an english menu. 🙂 My dad will give me a call then I will show up to TSUKASA as soon as I can . 😉 The menu made by Greg Dilley from Salinas,CA, USA who passed away in a few years ago. 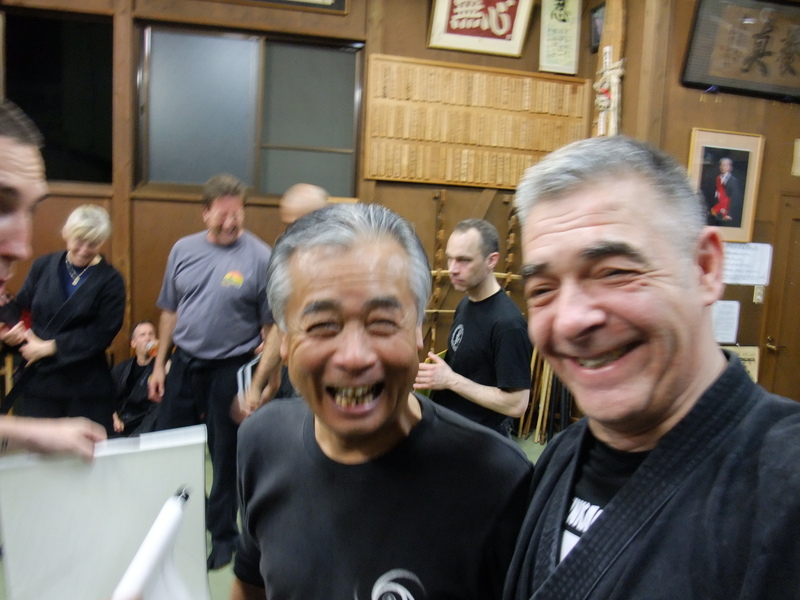 He is my first friend from Bujinkan, yes he is still my special friend. Hope you enjoy our Yakitori and Sake! Thank you for sharing your insights. This is very helpful. 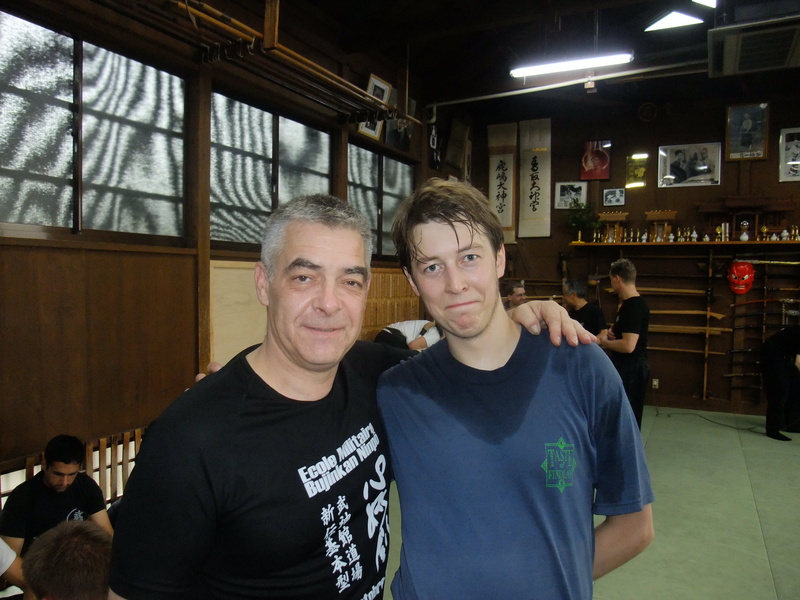 Sensei Arnaud thanks for your explanation about Oshi. I’ve never heared this term. Thanks for all your writtes and goods feelings here exposed. Great job!!! thanks for sharing your thoughts during your trip to japan its interesting to read . Arnaud, it is great to read your perspetive here.